If people spend an estimated 26 years of their lives sleeping, how much time would you guess your constantly-napping canine spends in bed? Dogs are known for their leisurely ways, and can usually find any number of spots around the home to curl up in and catch some rest, from the floor to our own beds. Sharing a bed with a dog can be nice, but may also come with its own set of problems and inconveniences, especially if your canine friend is young, high energy, or just doesn't seem to understand the concept of personal space. That said, should dogs have their own designated bed to sleep in? According to pet care product retailer PetSmart, dog beds typically fall into one of four categories: a pillow bed, a nest bed, flat mats, and orthopedic options. 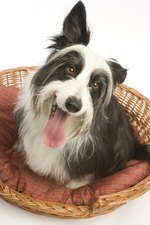 Because every dog is unique, and has their own particular tastes and needs, choosing the right type of bed will depend on your dog. Pillow-style beds are the most common as they are offered in a wide range of sizes and tend to be fairly affordable. Pillow beds are fluffy and comfortable but can become lumpy or dented over time, especially if your dog sleeps in the same spot day after day. The plus side? They usually come with removable covers that are machine washable to help eliminate odors and built-up grime. Mat beds offer a firmer sleep and don't usually indent over time like a pillow variety might but also don't offer any soft, fluffy bedding. Mat beds are easily transportable and, if sized correctly, can fit inside of a crate, which makes them a good option for anyone with a dog who sleeps or hangs out in one regularly. Nest beds almost resemble tiny couches, with a raised back and sides to essentially enclose your dog in the safe, comforting confines of a cozy material while she slumbers. Not all dogs will necessarily "need" a dog bed in order to be well cared for, but some definitely prefer it, and others can experience numerous benefits from having one, both physically and psychologically. With a ton of shapes and styles out there to choose from it may be tempting to purchase a bed for your dog to call her own, but what are the actual benefits of having a bed for your dog? For starters, having a designated sleeping area for your dog is a great way to set boundaries. The Humane Society explains that dogs naturally seek out dens as living quarters, so by providing an area for your dog to crawl in or onto you could send the message that this is their space. The New York Times also reported that dogs seek out safety while sleeping and prefer to sleep uninterrupted, so if you share your bed with your dog but tend to toss and turn, getting a bed for your dog may actually be better for them. This is the same logic behind crate training, which, over time, often results in the dog preferring to retreat to their crate for comfort, safety, or even just a bit of rest and quiet time. Additionally, there are some physical benefits to having a dog bed, especially if your dog is older or has physical issues that can cause discomfort, like sore joints. Unlike the hard floor, or too-soft cushion of a couch or mattress, a dog bed can offer support, be that a regular bed or an orthopedic design. Orthopedic beds are designed, or at least marketed, to offer support to dogs with physical issues for whom a regular bed may not be enough. Orthopedic beds are usually made of polyurethane foam or memory foam, both of which are used to provide extra assistance to dogs with issues including joint pain, arthritis, and obesity, to name a few. Some orthopedic beds also contain materials that allow the resting area to be heated or cooling, and others are designed like cots, which will keep your dog off of the hard floor entirely. As stated above, not all dogs need a dog bed in order to be well cared for. However, some definitely prefer it, and others can experience numerous benefits from having one, both physically and psychologically. If your dog has access to a "human" bed or couch at all times, can easily get on them, and has no physical problems, they might be fine without a designated dog bed. But some dogs may prefer to have a cozy bed to call their own.